You probably know this famous quote: “It’s difficult to make predictions, especially about the future”. It is so famous, logical and elegant that it is attributed to many different oracles. It is almost as difficult to analyze political developments just as they happen in front of our eyes. Still it is worth the effort to try, as better understanding of the situation can help us take a more constructive and effective role. And, as is inevitably the case, when we make mistakes in our analysis, and reality soon disproves us, those mistakes can also be used to critically examine our assumptions and analytic methods. So, what can we already learn from the events of October 2015 in Palestine? 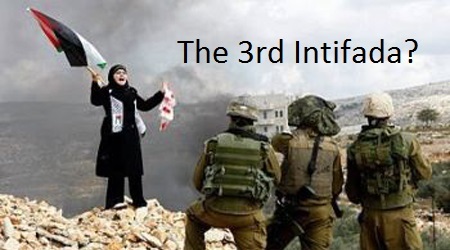 Most of the discussion that I’ve seen over the last month, and I mean those articles that tried to analyze the events, not just promote the cause of the Palestinian liberation struggle (or of the Israeli oppressors), concentrated around the question whether this is “a third Intifada” or just “a Heba”. Mainly they were attempting to assess the strength and durability of the current confrontation. This one-dimensional thinking seems to me to miss much of what can and should be analyzed. The development of the confrontation between the occupying state and the Palestinian society are influenced by internal economic and social changes within each side as much as by the course of the confrontation itself. Beyond this, events in Palestine are integrally connected to the system of control and social development in the Middle East and its place in the world. This system is now undergoing the most profound crisis in its modern history. And this crisis in the Middle East is happening against the background of major changes in the relationship of powers between the old imperialist powers and the emerging third world, while technological and cultural changes enable new ways of organization and resistance as well as new methods of oppression. It is not (or not only) about the blame game… Understanding the dynamics that led to the current climax is an important part in its analysis. It is my view that it started with systematic Israeli provocations. One small detail that testifies to this is that “events” in Al-Aqsa started around the 14th of September, the Jewish New Year holiday, which have no meaning for the Palestinians. Actually it became a tradition for the Israeli extremists to use Jewish holidays to initiate provocations in the holy places, hoping that the Army will be provoked by the Palestinian angry response and will retaliate with more oppression and massacres. In the last “cycle” it was only after more than two weeks of systematic provocations that there was wide Palestinian response, by the beginning of October. To understand the logic of the Israeli provocations, we can also go back to the previous round, in the summer of 2014. The Israeli army exploited the kidnapping of 3 Israeli youth on June 12, 2014, to initiate a wide campaign of terror against the West Bank population. In order to do it they hid the fact that the three were killed on the same night that they were kidnapped, and claimed to be searching for them to save their lives. In the following campaign they killed scores of Palestinians in the West Bank, arrested many hundreds, including many of those that were released in the Shalit prisoners’ exchange. Finally Israel launched full scale massacres’ campaign against Gaza, killing thousands. The settlers and religious extremists strengthen their hold over all the institutions of the Israeli society: political parties, the army, the police, the courts, the media and much more. Israeli politics is mostly about an unrestrained “populist” competition who is more openly and blatantly racist and oppressive. One of the most significant phenomenons of this cultivated insanity is the systematic growth of the “Temple Mount Lobby” and the extent to which it is taking hold within the heart of the establishment. We should not really have to dive into the depth of the Zionist spirit in order to analyze and understand the functionality of these “messianic” trends. The Zionists rely on their total military superiority against the mostly unarmed Palestinians and calculate that in any confrontation the Palestinians pay a much higher price in martyrs, physical injuries, thousands of prisoners and destruction of the infrastructure of civilian lives. In their quest to complete the ethnic cleansing of Palestine, what the Zionists are looking for is any opportunity to use their military power against the local population without paying too high price in the region or internationally. Now they calculate that the people of the region are too busy with internal struggles, and the regimes of the region are all mobilized to oppress the masses in their own countries in the most criminal ways. In this atmosphere almost any crime against the Palestinians can pass without severe repercussions. The first Palestinians response, at the beginning of October, was mass demonstrations that started in Al-Quds and spread across the West Bank, Gaza and the 1948 occupied territories. In Al-Quds there was mass participation in the demonstrations day after day, like in the first intifada. In Gaza the first mass demonstrations near the Israeli border fence were met with deadly fire against unarmed civilians. I will relate later with more detail to the struggle within the ’48 areas, but it is important to note here that it combined a general strike and mass demonstrations as well as many initiatives by young activists all over the country. The Knesset passed extraordinarily fast the new law that sets long minimum prison sentences for the offence of throwing stones, even if there was no damage caused. In case somebody might get confused, the severe sentencing is only for “nationalistic” or “terrorist” stone-throwers, so Jews can go on throwing stones at will. The police give priority to oppressing Palestinian protest over any other issue. Mass arrests are used for any offence from Facebook status through peaceful demonstration to confrontations. The police and prosecution make mass trial against the youth that took part in the protests and do whatever they can to keep the accused in custody for the time of the trial. The courts regard Palestinian protest as a kind of “terrorist activity” that deserves detention until trial, unlike any other offence. Collective punishment was applied against all Arab residents of Al-Quds with roadblocks, closures and police harassment. Administrative detention is now used not only against the political leadership but also against activists, even some teenagers. The most severe measure is the usage of live ammunition by the police and the army against demonstrators. It is now systematically used in the Arab neighborhoods of Al-Quds. Those draconian measures reduced very much the mass protests but increased the pressure and the anger within the Palestinian population. As the price of political protest became higher, so there is stronger motivation for revenge and for physically attacking the occupation forces or the Jewish population, which is conceived as responsible for the occupation. This led to the wave of knife attacks and some armed or vehicle attacks, mostly by desperate youth that acted on their own. It should be remembered that the “pacification” to which the occupation aspires doesn’t mean peace and security “for everybody” but the continuation of the expropriation and humiliation of the Palestinians without any response on their side. While mass protests are brutally oppressed and any kind of organized resistance is relatively an easy target to the security services – the individual acts of violent resistance are harder to prevent. They are conceived as success as they cause some harm to the occupiers – also the highest price is usually paid by the initiators. Faced by the new challenge of individual attacks which they couldn’t prevent, the Israeli authorities encourage the public, the police and the military to lynch and kill every Palestinian that is suspected of attacking or intending to attack Israeli security forces or civilians. I already wrote in more detail about the Lynch as an official Israeli policy. One clear example is an interview with “mainstream politician” Yair Lapid (in Hebrew) in Walla, on October 11, where he said that “The instructions should be clear: Everybody that takes out a knife or a screwdriver should be shot to kill”. In the racist Israeli-talk it was clear that, in this case, when he speaks of “everybody” he means Arabs. More than 75 Palestinians were already killed in this last wave, the vast majority in incidents where no Jews (soldiers or civilians) were attacked or injured. In all the cases the official report is about “Mehabel” – a special Hebrew term, supposedly worse that regular “terrorist”, which is used for Palestinian resistance fighters. The only cases that were recognized by the Israelis as “mistakes” were the Eritrean guy that was mob-lynched in Bir As-Sabe’e (Beersheba) and a religious Jewish guard that was killed by soldiers in Jerusalem. The mistake, as was clearly stated all over the Israeli press, was that they were mistakenly identified as Arab. Comparing the recent events with the latest two Palestinian Intifadas is very useful. One apparent difference is that in both of the Intifadas the whole Palestinian society was mobilized for the confrontation. Another, related, difference is that Intifadas were basically political struggle waged under the assumption (which later proved to be an illusion) that a political settlement is imminent. Here I would like to express the view that the readiness of people to make the effort and bear the suffering that insurrection against an oppressive regime requires is basically motivated by hope. In the first intifada it was the belief that “the Palestinian state is at a stone’s throw”. It brought the Oslo agreement but no real freedom and no relax in oppression, ethnic cleansing and settlement building. The second Intifada was fueled by the belief that if the stones didn’t drive the occupiers out then rifles might do it. It worked for some degree in Gaza, but Gaza was put under siege and is regularly bombed. The occupation’s hold over the West Bank is now deeper than ever. The current wave of struggle is different as it is not motivate by the hope of political solution but by disillusion with “the political process”. Still, trying to read the mood in the Palestinian street, I don’t think it is only “despair”. I think the Israeli hysteric response to the latest struggle is conceived as a sign of weakness. The major changes that take place in the region also inspire the belief that powers can fall and the people can change the course of history. This renewed intense struggle against the occupation, not centered on any political program or the hope for political settlement, is thus not seen as an intense “round” in the historic conflict but more like a “new normal” where both the occupation and the resistance are taking a more violent form. Concerning the internal development of the Palestinian society, the first Intifada can be seen as a revolutionary movement. The youth that mobilized in the liberation movement for armed struggle just after the occupation, and later begun to build new civil society in the seventies and eighties, toppled the dominance of the local conservative leadership and led to reorganization of society under the united leadership of the Intifada. The second Intifada was more like regular war. The Palestinian movements and organizations already established themselves as at the commanding posts of society under the occupation. The newly founded Palestine Authority (PA) was torn between its obligation under the Oslo agreement to defend the occupation and the disappointment as it realized that Israel has no intention to let it develop into a fully independent state. The forces of the Palestinian society, including much of the established leadership, were mobilized to try to push the occupiers out. In the current wave of struggle the internal dynamics of the Palestinian society are very different. The establishment of the PA resettled after the second intifada back to its function as supplier of local services and a security buffer under the occupation. The youth that are leading the struggle are doing it at their independent initiative, sidelining the PA establishment but not yet challenging it. Learning from history, we may expect that the next waves of struggle will require and bring more dramatic internal changes within the Palestinian society itself. Writing in Haifa, it is natural that I will relate in some detail to the experience of the struggle inside the ’48 occupied territory. Demonstration started on Monday, October 5, in several locations. One of them was a protest vigil in the German Colony in Haifa, which was initiated by Herak Haifa but organized under the united banner of “The Patriotic and Democratic Forces in Haifa”. It developed into a small spontaneous marching demonstration. Al-Herak Shababi called for a country-wide mobilization to a demonstration in Nazareth, on Thursday, October 8. This call was met with new level of oppression: Some of the organizers were arrested on the day before in preventive detention (3 women activists were arrested with their fathers!). They were held in prison for 4 days. Buses carrying demonstrators were prevented from reaching Nazareth. The demonstration itself was attacked by the police and more than 20 of the participants were arrested. 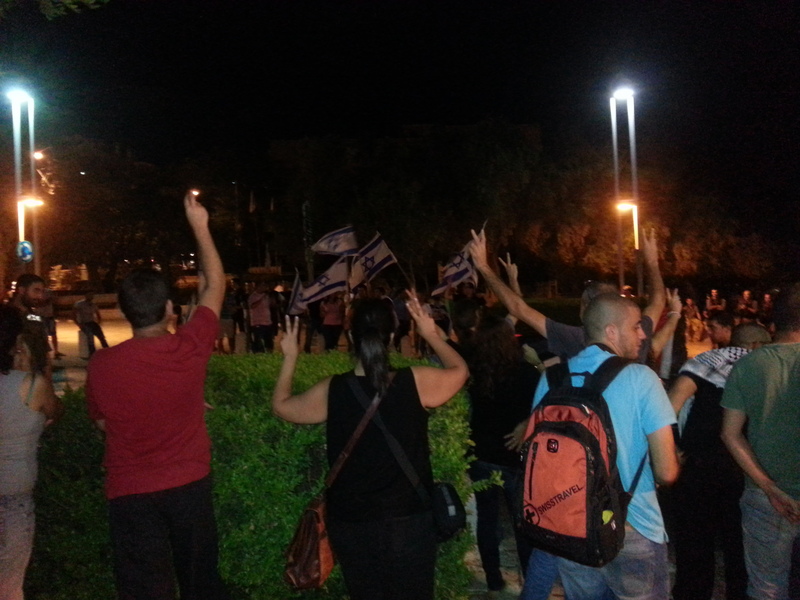 Some of the demonstrators that were prevented from reaching Nazareth went on to demonstrate in Um Al-Fahm and Tamra. In Tamra the police arrested 3 of the bus drivers, kept them in custody for the night and took hold of the buses for several days. On the next Tuesday, October 13, there was a general strike of the Palestinian population and a mass demonstration in Sakhnin. The feeling was that, after long time, the people are really united in struggle. But what seems most significant for me was that this time it was not only the political parties or even the new and more dynamic structures of the Herakat that organized and led the struggle. Many demonstrations were organized, between October 5 and 14, by local groups of activists. Many of them developed into clashes with the police. Hundreds of activists were detained and many are now still in prison and facing trial. This level of mobilization is not totally new. It happened in the day of the land in 1976 and after the massacre of Sabra and Shatila in 1982. It was seen on a much higher level in the beginning of the second intifada, in October 2000, when a general strike and mass demonstrations brought all areas with Arab population to a standstill for 10 days. It was seen again during the latest onslaught on Gaza in summer 2014. But, relatively to most of the above mentioned events, this time there was no mass massacre to respond to, so it can be interpreted as a step forward in the organization of the activists and their ability to initiate protest. Form a better connected network. Be involved on a daily basis in the struggle against discrimination and Apartheid in a way that will be felt by and gain the trust of the general masses. On the organizational level, a new type of mass organization, based on modern communication, can unite Palestinian activists and struggles beyond fences and borders. On the political level, the struggle requires a political agenda that will expose and replace the current bankrupt one. I must admit that I didn’t spend a lot of time following events in the Israeli society during this October. Still I have the feeling that in the face of the new challenges and the intensified crisis the level of political opposition was disappointing. Faced with the challenge of the second intifada and the failure of the Oslo agreement, organizations like “Ta’ayush” and “Anarchists against the wall” changed the paradigm of the left in the Israeli society form a “pro-peace” lobby within the Israeli side of the conflict to “joining the Palestinian struggle against the occupation”. In the latest events, those demonstrations that took place were mostly back at the old paradigm of equating the “two sides”. But, unlike the old days when the Israeli “peace camp” was strongly devoted to the illusion of the “two state solution”, now we hear them calling for peace without any concept or concrete program what this peace may be and where it will come from. The most encouraging things that I read in the Israeli papers were the growing disillusion with Zionism as a whole, as a result of the deepening crisis. The talk about the paradigm of the “One State” is more ubiquitous than ever, even as the clear voice that calls for One Democratic State with full rights to all as a just and positive solution is hardly heard. It is worth mentioning that the current wave of struggle forced Israel to some tactical retreats about provocative steps other than the extreme measures that were directly intended to suppress the protest. The most obvious example is Israel’s proclamations of its obligation “to keep the status quo” in Al-Aqsa. Another example was the temporary suspension of the work on the anti-Arab “nationality law” in the Knesset. Another issue that exemplifies both Israel’s hysteric and shameless response as well as its retreat before mass pressure was the much trumpeted decision to hold the bodies of Palestinian martyrs. It caused a wave of mass protest in Al-Khalil that led to the returning of some bodies and much wider public funerals. Netanyahu has just lost his most important political struggle on the world stage, to drag his imperialist sponsors into war against Iran. Israel used to be an important advanced position for imperialism to guard its interests in the Middle East. But Israel, as it is hated by the Arab masses because of its racist policies, is not an acceptable partner in any of the local and global coalitions that are now fighting for control of the boiling Arab East. As Israel is losing its “strategic value”, the tension in Palestine is a constant drag not only on Israel’s image but also on the reputation of the Western powers that back it. The “Temple Mount Lobby” that is nourished by the current government is threatening to become a regional time bomb which nobody could ignore. Like all reactionary forces in the region, Netanyahu tries to ride the so-called “Islamic State” horse in order to resist any change and paint any movement that struggles against the current oppressive order as “terrorists” and a danger to the world’s peace. Freedom and democratization in the Middle East, the establishment of pluralistic society and new social and economic development plans that will care for the people are still the best foundation to expose and eventually uproot Israeli Apartheid. It is just a Child… So easy to kill, so hard to report! The Israeli occupation army shot dead today (Sunday, 10 August 2014) the boy Khalil Al-‘Anati in the Al-Fawar refugee camp in Al-Khalil (Hebron). Reuters, the news agency, reporting in Arabic, brought also the response of the Israeli occupation army. It claimed that there was “a violent riot” and that the soldiers “shot at the main inciters and identified a hit among them”! This is another crime in the endless chain of Zionist crimes against the Palestinians, the original inhabitants of this land, who are expelled, dispossessed, occupied, exploited, oppressed, persecuted and slaughtered wherever they go. The continued Apartheid regime and the daily killings is possible not only because of the criminals who pull the trigger and those who send them, but also because of the denial mechanism within the Israeli civil society for which the murder of the child Khalil Al-‘Anati is not even a meaningful piece of news, no news at all. It is common practice in Israel that a soldier who dies in battle receives immediate promotion of his rank. Similarly, a child that is killed by the soldiers is “promoted” to the rank of “youth”. By the way, I re-read many Palestinian sources and all of them speak about Khalil as a child – “tifl” in Arabic. 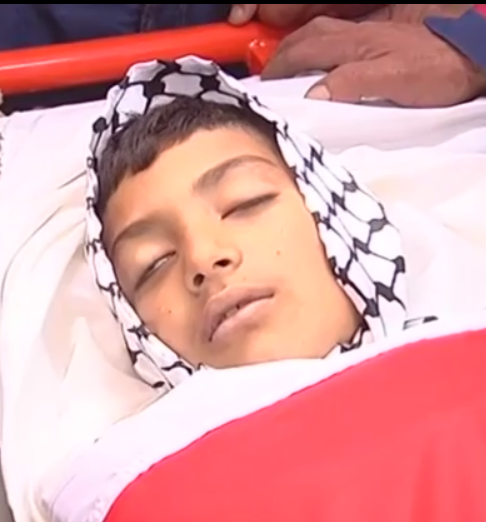 “12:04 Palestinian news agency Maan reported that 12 year old was killed from IDF forces shooting in Al-Fawar refugee camp in South Hebron Mountain. According the report, IDF forces entered Al-Fawar for unknown reasons, a confrontation developed with local residents, which threw stones. This way Haaretz managed to maintain its readers’ peace of mind and to report the “incident” four times without mentioning the C word, A CHILD (or a BOY). This hardship to tell the truth as it is, to report how the IDF is killing children, helps to make the killing itself much easier and more ubiquitous. (This post was originally published in Hebrew). The general political atmosphere in Haifa during the past month was quite terrible. While during the second “Lebanese War” in July 2006, and during the Zionist Christmas eve onslaught on Gaza in the winter of 2008-9, there were almost daily anti-war demonstrations, this time is different. Even before the beginning of the attack on Gaza on July 7, we lived through a month of Zionist incitement, which meant, on local level, that almost every quite Palestinian protest vigil finished with some of the participants being detained. This, of course, didn’t deter us from demonstrating against the massacres rampage as it was launched. There was a small protest in the German Colony on the first day of the attack, and a bigger one on Monday 14/7, in Emil Habibi Circle in Wadi Nisnas, which developed into a spontaneous march through the streets of The Wadi, Haifa’s main Arab center. For the next weekend two big demonstrations were planned. The youth movements (Al-Herak Al-Shababi) called for a march on Friday 18/7, to start in Abbas Circle and march through the Arab neighborhoods. The “Democratic Front” (Al-Jabha Al-Dimokratiya) called for Jews and Arabs to march together on top of the Carmel Mountain, in Moria Avenue, the main route of the Jewish city. Toward these demonstrations there were even more Zionist incitements, with Haifa’s Mayor, Yona Yahav, which in most times proud himself for presiding over a peaceful center of coexistence, taking a leading role. He called on the police to prevent the demonstrations, even though the Jabha’s demonstration was licensed by the Police under a court order, and even called on them to prevent Arabs from outside Haifa that want to take part in the demonstrations from entering the city. On Friday the Youth peaceful demonstration was brutally attacked by a big police force, with the Yassam “anti-riot” squads. Some 30 demonstrators were arrested and many were injured. There was not much protest in Haifa since this weekend. We were going to demonstrations in Nazareth, Shefa’amer, Akka, Al-Lid, Tel Aviv and many other places – but Haifa stayed quiet, somewhat traumatized. When the news came that the right wing is preparing to demonstrate in the German Colony this Saturday, 9/8, supposedly in front of the “Friendship Club” (Nady Al-Ukhuwa) of the Democratic Front, there was some concern. Till now the Right in Haifa almost never enters the Arab neighborhoods. But now, after they smelt blood in the Carmel, would they dare attack us at our homes? At the event this was not frightening at all. The famous “secret police” officer, who stays on the other side of the street in our demonstrations, was chumming with the few demonstrators, and one of our secret observers heard him asking why so few people showed up. “You know, we put the invitation on Facebook, and these are the people that came”, was the honest answer. “Bring me Hummus, Chips and Salad” – portraying their view of their relations with local Arabs. “You Don’t Have a State!” – Something we already noticed. “A Jew is a soul – An Arab is a son of a whore!” –a racist version of a common football chant. Most of the other stuff I will not repeat here, as it was graphical sexual abuse. At one point we were astonished again. They all started to sing, to the rhythm of a Hassidic hymm: “The entire world hates Israel!”… We almost joined them. What can you write that will knock the minds of people who close their eyes to the sight of burned kids and whose ears are deaf to the screaming of relatives who lost all their dear ones in the targeted mass killing of whole families by the most sophisticated western air force? One of the best Zionist writers that I follow recently is Uri Misgav from Haaretz. At the beginning of the latest attack on Gaza he declared that Israel already failed, because it started a military operation without any conceived goal that can be achieved. But he failed to read the writing on the wall. The Israeli politicians had a very clear goal that the mob was chanting in all the “demonstrations” that prepared for the rampage: “Ma-vet la-a-ra-vim!” – “Death to the Arabs”. When the Zionist mob gets out of control in the streets of Jerusalem – hunting the city’s cleaners and falafel sellers to beat and lynch – the Zionist law and order authorities and respectable media have a common phrase to hold them back: “Don’t take the law into your own hands”. Israel is a Jewish Democracy and its politician should give their electorate what they want. General Schwarzkopf once said it is not worth the while to hold a bulldog if you don’t let it loose from time to time. For a long time Israel didn’t really needed a complete policy – it was pushing for a new attack until the rope was loosened to let her go after its victims. Then her master could hold it back for a nice profit for itself and throw a fat bone to the dog. Till now, in all Israeli thinking about the politics behind the military rampage, the main task of the politicians and diplomats is to “buy time” for the military to act. The Israeli generals and politicians are now looking to find how loose the rope is. Yesterday they bombed two UNRWA schools where Gaza families found shelter after they were expelled from their homes by previous bombings. Today they bombed another hospital, killing patients in their beds. They also successfully targeted a Palestinian ambulance, killing and wounding members of the medical team. The daily death toll in Gaza is now more than 100. Of course, according to their military-technical potential, they could kill as many Palestinians as they like. But they need some justification, and they are somewhat afraid to be brought to justice for their war crimes. This was the logic behind the entrance of the ground forces into Gaza. Some spilling of Israeli blood and the need to protect their soldiers was the best justification for much wider massacres of the Palestinians. Now the fairy tales about the need to destroy Gaza “terror tunnels” is used to buy time for more killing spree. Historically Zionism and Israel were used by the different imperialist forces to subdue the Arab national movement. Egypt’s president, Anwar Sadat, declared that 90% percent of the cards are in America’s hands – before throwing away any semblance of national independence and remaking his country into a colony. At those times the break on Israel’s atrocities was the famous “anger of the Arab street” – the fear of imperialism that mass struggle aroused in solidarity with the Palestinians will put in danger their servile Arab regimes. Now, after the Arab spring of 2011, the Arab anger is no more a frightening potential… Currently the war for democracy and freedom in the Arab world and the Middle East have so many hot fronts and so many internal contradictions that there is nobody to turn to. The dearest strategic asset for the US – the Egyptian regime – is a special case. It used to be an authoritative regime that tried to have national and international respectability. Now it is a counter-revolution in the making, fighting the Egyptian people in the streets and competing with Israel in inciting against the Palestinians. The western regimes and much of its media seem completely undisturbed to justify any war crimes on the side of Israel as “self defense”. More than ever – we need the world’s people to make a stand and stop the killing. Karmiel was born in sin – it was a cornerstone of the “Judaization of the Galilee” racist colonialist project. It was built on large areas of land that were confiscated from nearby Arab towns and villages. This confiscation was not for development for “public purposes” – as claimed by the Israeli government’s confiscation orders – but in order to uproot the residents of the area, concentrate them in ghettos of poverty and settle in their place another public – exclusively those adhering to the Jewish religion. Galilee Apartheid reality, represented by Karmiel, Misgav “communal” settlements, Nazareth Illit and their likes, does not end with the expropriation of land and its allocation according to racial criteria. Judaization is a comprehensive policy encompassing all aspects of life: discrimination in building infrastructure and providing services to residents; endless obstacles obstructing residential construction in Arab communities while encouraging Jewish settlement; blocking economic development in the Arab ghettos versus benefits and incentives to enterprises in the Apartheid towns. The most outrageous illustration of Karmiel’s character as Apartheid City is the fate of the residents Ramiya, who live on their own land, which was lawfully registered in the Land Registry Office, long before the establishment of Karmiel. When Ahab of Karmiel desired the vineyard of Naboth and his land, he was ready to use any means to get them. Usually the legal excuse against unrecognized Arab villages, built on their private lands, is that they are built on agricultural land and therefore no building can be legalized there – even if it is an old building, standing there before the planning law itself. (For building Jewish settlements, of course, the designated usage of land is easily altered). But Ramiya’s lands are in the midst of Karmiel’s building areas. Why not recognize Ramiya’s houses as a separate village or as part of the city? The answer is obvious: because the city was founded for Jews – and Arabs should be evacuated. A sweeping confiscation order against Ramiya’s lands was issued already in 1976 – on the grounds of “public needs” – at the height of the “Judaization of the Galilee” drive. After a long legal battle Israel’s “Supreme” Court upheld the expropriation on March 1, 1992. But the abuse of Ramiya’s residents didn’t stop at the expropriation itself. In order to force the residents to give up their houses and lands, Karmiel’s Municipality and various state agencies wage a deliberate policy of siege and deprivation of basic needs against Ramiya’s residents, which can’t but remind us of the siege of Gaza. One example that cries out to heaven is preventing Ramiya’s houses from connecting to the electricity grid. When residents bought generators, (who learns by candlelight these days?) the “good neighbors” complained about the generators’ noise. Instead of providing electricity to the residents, Karmiel’s Municipality sent inspectors to demand the shutdown of the generators at night and left Ramiya’s residents in the cold and dark. In the early 1990s Ramiya became the center of the struggle against the Judaization of the Galilee. On one opportunity the central Land Day demonstration was held in Ramiya. Later there was a mass march from Majd al-Kurum to Ramiya. Public pressure forced the Israel Lands Administration to agree to negotiations and finally reach a compromise, which was signed as an agreement with the residents in 1995. The agreement, as signed, is far from doing justice. According to it the village will be destroyed and with it the existing fabric of life. The residents succumb to the racist expropriation forced upon them. It allows the state to take over the lands of Ramiya for a compensation that is a small fraction of their market value. However, the agreement, to some extent, breaks the principle of Apartheid around which Karmiel was founded by enabling Ramiya residents to stay in the area and build their homes. To this end the Administration undertook to provide 30 building plots in a special neighborhood that will be built in Karmiel. The agreement also included the provision of compensation to Ramiya residents in the form of 15 building plots and some farmland outside of Karmiel. The Israel Lands Administration, which hurried before the agreement to try forcibly evict the residents, was in no hurry to fulfill the agreement. More than five years passed before it allocated the proposed land for resettlement of Ramiya’s residents in a new neighborhood of Karmiel. The residents also were in no hurry to give up their homes and lands with which their lives’ stories were entwined. Finally, between 2001 and 2003, the Administration began implementing the agreement in its own way: Take control of as much land as it can and allow as few Arabs as possible to remain in Karmiel. It signed an agreement for the evacuation of two families that possessed more land but had a smaller number of inhabitants and gave them about 35% of the land intended for the construction of the new neighborhood (which had shrunk meanwhile from 30 to 29 plots). The Administration informed all other residents that they must make do with what was left. By doing so the administration is trying to force a reality which clearly does not maintain the minimum that was to be guaranteed by the settlement agreement – enabling Ramiya residents persist as a community and build their lives in their village. At this stage a legal miracle occurred for the residents of Ramiya. Would you expect the Administration to rush to comply with the verdict and allow all Ramiya residents to build their homes in Karmiel? Not in Israel. We have seen it in many cases in the past, most famously in the case of displaced villagers of Bir’am, Iqrit and Ghabsiyah, where the Supreme Court issued orders allowing them to return to their lands. Even if “by mistake” an Israeli court issues a ruling recognizing some rights of Arab citizens, it is nothing but an unfortunate mistake to be fixed by another judicial ruling or directly in practice by the authorities. In our case, the Administration made the petitioners who won their case to join other judicial proceeding dealing with the cases of other Ramiya residents, which was held in the same Haifa District Court. In this proceeding (civil case 35576/12/10), the Administration found a sympathetic ear in the form of judge Lamshtreich–Leter, which justified all the claims of the Administration, embraced all claims against the residents and even invented new arguments on her own behalf. In her judgment issued on August 5, 2013, contrary to custom, the judge ignored the previous verdict of judge Raniel issued at the very same court, and turned his ruling upside down. Judge Lamshtreich–Leter was not content “only” to justify the theft of lands belonging to Ramiya residents and to order their deportation from Karmiel. She went farther and put forward her own militant agenda, ruling that any of the residents who would not sign an evacuation agreement with the Administration within 90 days (until November 4, 2013) shall be deemed to renounce voluntarily his rights within the framework of the 1995 settlement agreement and would have to evacuate the area immediately. The residents filed an appeal against this draconian ruling in the Supreme Court (Civil Appeal 7198/13). The hearing of the appeal on its merits was not yet been held, but Judge Barak-Erez, in her decision of November 11, 2013, refused to grant suspension of execution of the evacuation until the hearing of the appeal and required the petitioners to pay the costs. The most disgusting aspect of the authorities’ conduct in this context is their systematic efforts in sowing discord between Ramiya residents. The method is simple: The Administration announced that the 30 plots allotted to the new neighborhood in Karmiel are the last offer for Ramiya’s people and that if any of the residents had no place to live this is an internal problem of the division between the residents. Thus we see, unfortunately, some lawsuits by Ramiya residents against other residents. When judge Raniel ordered the Administration to allocate additional plots, the Administration completely ignored this directive. On the other hand, judge Lamshtreich–Leter, in her ruling, adopts this quarrel-mongering tactic wholeheartedly and finds for it new justifications out of any context. But the arbitrary and scandalous judgment, which denies the achievements of the residents in the agreement of 1995 and ordered their immediate evacuation without housing solutions, finally re-united the residents and re-ignited the public struggle over the principled issues, against racist evictions and land grab. After decades of suffering and persecution, the drama in Ramiya is approaching the moment of truth. Will forced evictions take place? Is the city of Karmiel determined to solidify its position as Apartheid City through a celebration of destruction and violence? Let us not forget that the struggle against dispossession and evictions in Ramiya takes place concurrently with the struggle against the “Prawer Plan” for ethnic cleansing against the Naqab (Negev) Bedouin and their concentration in ghettos, as well as similar dispossession and deportation programs in South Mount Hebron, the Jordan Valley and other areas. The guiding principle in all these cases and many others all over Palestine is the dispossession of the indigenous people on a racial basis, the theft of their lands and its re-allocation for the benefit of Apartheid Settlements. You can help us in the struggle to stop Apartheid. The Follow-up Committee of the Arab population calls for a demonstration against the eviction of Ramiya and for the right of all Ramiya residents to live on their land, as an independent village or as residents of Karmiel. The demonstration will take place on Friday, December 20, 2013. Gathering will be at 13:30 in front of the Municipality of Karmiel and from there we will march to Ramiya. If you can’t come that far you may organize a parallel vigil elsewhere and let us know. The Friends of Ramiya group on Facebook was established to help organize solidarity activities. You may publish and share this publication, as well as invitations to different activities. This publication is available also in Arabic and Hebrew. ברצוני להביע את מחאתי נגד נישול תושבי ראמיה ונגד הכוונה להרוס את בתיהם ולפנותם מאדמתם. נישול ופינוי תושבים ערבים כדי לשכן במקומם תושבים יהודים הינו צעד גזעני שנוגד את ערכי היסוד המקודשים של החברה האנושית. יש לאפשר לכל תושבי ראמיה לגור בכבוד כתושבים בעלי זכויות מלאות באדמת כפרם. I want to express my utmost protest at the expropriation of the people of Ramiya and against the intention to evacuate them from their land and destroy their homes. Expropriation and evacuation of Arab citizens in order to settle Jewish citizens in their place is a racist measure that contradicts the sacred values of Humanity. All the people of Ramiya should be allowed to live as equal citizens with full rights on the land of their village. You report that Israeli leaders will be attending Nelson Mandela’s funeral on 15 December (World leaders converge on South Africa, 7 December 2013). However, Israel is a state which actively practices apartheid against the Palestinians under its rule, and had very close ties with apartheid South Africa. Allowing leaders of such a state to attend Mandela’s funeral would be grotesque and in our eyes make a mockery of his and South Africa’s battle against apartheid. It is common knowledge that the police are taught the art of “dry beating” – causing a lot of pain but not leaving clear marks to show in court. Well, today’s police apparently lost this fine art. 21 demonstrators who were arrested on Saturday in the “Day of Rage” demonstration in the German Colony in Haifa downtown were brought to the court yesterday (Sunday 1/12/2013) for remand. Many of them did not have to raise a shirt or roll up their pants’ sleeves to show the judge their bruises – signs of trauma and blood were easily seen on their faces. Sabrin Diab, a young woman from Tamra in the Galilee, appeared at court with a broken arm fixed in plaster (in the picture, last on the left in the rear) – as a result of the beating she had taken at the time of her arrest. When the lawyers of some other detainees asked the police representative in court “Did he receive medical treatment?” the answer was uniform and laconic: “whoever asked for medical treatment received it.” One after the other the detainees stood up and testified about beatings and pains – and the refusal of the Haifa police and the guards at the Jalameh detention center (“Kishon”) to allow them to see a doctor or receive treatment. In the last days the Israeli media was full with incitement by the heads of the racist Zionist establishment against the demonstrators protesting the “Prawer Plan”. Netanyahu’s call to “prosecute them to the end” was not lost on the Haifa police. The police chose to request remand for 21 of the demonstrators that were detained in Haifa, two of them minors. When the hearing judge decided this morning to release the two minors and send them to house arrest, the police rushed to ask for a stay of execution and appealed. Fortunately the enthusiasm and wild exaggeration did not serve the police well this time. The police representative tried to describe the situation as if the German Colony’s streets were full of stones being thrown and told about many policemen that were injured and needed treatment. When asked to provide details he could not name even one policeman who was injured and could not provide any medical certificates. When the police prosecutor was requested to elaborate how were the “suspects” armed and asked whether any weapons were sized he claimed that they were armed with stones, which were naturally thrown and therefore not caught with the protesters. When asked what was the role of each of the suspects he responded only that “the evidence is before the court.” In some cases the judge volunteered to review the material and answered instead of the policeman – and in all those cases it appeared that the suspects were charged in their initial interrogation only with “assaulting police officers” and all the issue of stone-throwing (or any other “weapons”) was not even mentioned. From what the detainees told in court we learned that they were beaten hardest after their violent arrest. The police established a forward command center in a municipal building on Radak Street near Carmel Boulevard (“Ben Gurion”). The cops were leading the detainees to this center where they could beat them freely away from the media and the public. One detainee told how a policeman held him down by pressing his knee (the cop’s) on his neck while punching fists in his face. The signs of the knee and punches were easy to identify. A declaration of the Haifa “popular committee” that was published (in Arabic) against the violent dispersal of a demonstration accuses the police also of sexual harassment in words and deeds against female detainees. The detainees complained that they were denied food and drink all the way at the Haifa police station, in prison and while in detention in court. One of the lawyers even asked whether starving the detainees is part of the many “investigation acts” taken by the police in this case. Many representatives of the media attended the court hearing. There is no doubt that the “Day of Rage” protest on Saturday brought a quantum leap in public awareness to the Prawer plan to dispossess the Arabs of the Naqab (Negev in Hebrew) and the resistance it evokes. It is common practice that, while the detainees are brought into the court, reporters and photographers get a “time out” to take pictures and interview them. These are often difficult and embarrassing moments for detainees. This time the detainees entered holding their heads high and happy for the opportunity to speak out – obviously proud to take part in the just struggle against ethnic cleansing. They rushed to make statements to the media about the objectives of the struggle. Some of the detainees raised their hands with the victory sign upon entering the hall. Many of the defense lawyers explained and stressed in court that this is a legitimate, just and even indispensable struggle of the Arab population against the injustice done by the state. Some lawyers even mentioned that they themselves participated in the demonstration. Meanwhile the appeal hearing about the release of the two minor detainees was held in the district court. Under pressure from the court, the parties agreed on postponing the release until 8 pm. After long proceedings that filled most of the time from 9:30 am to 17:00 pm, the judge decided to release the rest of the detainees. The prosecution announced that it plans to appeal. Six detainees, including Sabrin Diab with the broken arm and lawyer Suhair Assad were released anyway. Release of the rest, two women and eleven men, was postponed until the appeal hearing on Monday. Today (Monday, December 2) at 14:30 the Haifa District Court decided to dismiss the prosecution’s appeal and release all the detainees – some of them under house arrest. This post was initially published in Hebrew. No doubt Netanyahu feels the same about the war on Iran. No wonder he lost his nerve and cries with full tears at the face of any western leader that is ready to speak with him – like a spoiled baby when his parents forcibly take from him the precious glass ornament he was trying to break. To be honest with my readers, I must admit that I’m not objective in analyzing the fate of the missed war on Iran. For a long time I called this war, in my private thinking, “the war in which we all might die”. It is typical of the thinking of the generals and frustrated lower officers (like Netanyahu) which are leading Israel that they only think of what they can do. They are always enthusiastic about how they will beat “the enemy” painfully. When the other side beats back, they feel betrayed and start to shout and cry as innocent victims. Israeli Pavlovian patriotism makes sure that any aggression will be supported and the generals and leaders will not be blamed, unless they lose the war. For the civilian victims of their military adventures on their own side Israel’s military leaders have harsh advice: You should suffer quietly and not disrupt the army. We have seen it in Haifa during the 2006 Israeli attack on Lebanon how the Israeli “civilian” government simply stopped functioning in all the north area. Many people in the north, who felt “dispensable”, found condolences in thinking that next time the Tel Aviv “bubble” will share the burden. For a long time Israel tries to project an image of itself as “a villa in the jungle”. It tries to show how its civilized population is always endangered by the surrounding barbaric people of the Middle East. It echoes well with white-racist prejudice in Western Europe and North America, with colonialist nostalgia and Islamophobia. This image is used to explain why Israel should be armed to its teeth and why any violation of the Human Rights, National Sovereignty or the security of Palestine’s native population and of the neighbors should be ignored. After all only Israel is always under threat to its very existence. It is the “sleeping beauty” that Western Imperialist knights fight to save. In order to perpetuate this perspective, Israel works hard not only to guard and expand its own Villa, but also to keep the Jungle around from turning any better. The list of criminal actions committed for this purpose is endless. Already in 1954, Israeli agents planted bombs in Western civilian targets (like cinemas and a library) in Cairo in order to destabilize Egypt and encourage Western aggression against it. In the Eighties Israel and the US took care to keep arming both sides of the Iraq-Iran war in order to prolong the bloodshed in which more than a million people were killed and colossal destruction was caused on both sides. Until Hezbollah reached the ability to fire back, Israel was regularly bombing refugee camps and infrastructure in Lebanon. It will not be just to blame Israel for all this. As General Schwarzkopf once said, there is no sense holding a bulldog, if you don’t let it loose from time to time. Israel was planted in the Middle East by Western Imperialism in order to prevent the emergence of really independent Arab States. It is paid to do the work it is doing. As happens with any policeman, Israel naturally cares for its own interests first. Ariel Sharon used to say: “Arabs may have the oil, but we have the matches.” Playing with fire is an efficient way to keep the high prestige and high salary of the fire brigade. Whenever crime goes up – you don’t fire the police (which apparently failed) but give it more powers. But the equation that made Israeli aggression so profitable for the West is not working any more. Israel has the military power to strike, but not the soft power to make things go its way. Its blatant anti-Arab racism makes it an unacceptable ally in the region and a public relation liability to its external sponsors. The only time it tried to directly control an Arab country outside Palestine, during the 1982 invasion of Lebanon, it aroused popular resistance that forced it out unconditionally after 18 years of war. The net result was that the most fierce resistance force became the main force in the government of Lebanon. The 2003 war on Iraq was another disaster for the Imperialist/Zionist system of hegemony. First, instead of fighting its masters’ wars, Israel was a main force in dragging the US to fight for it. Once again, the imperialist aggression was met with mass resistance. The war for oil, which was planned to be highly profitable, ended costing so much that it helped to push the mighty superpower into the deepest economic crisis in sixty years. On the political level, the war toppled the already isolated Saddam Hussein, which could not damage anyone but his own people, and brought a new Iraqi government under Iran’s sphere of influence. All this didn’t deter Israel from mongering another, bigger war, now against Iran. This is no surprise – Israel as a military tool can’t but drag itself from war to war. Actually, since their almost-defeat in 1973, they always plan the next war as a way to compensate on the trauma of the last war. But for the US, after its internal regime change that was caused by the Iraq war, this was one war too much. Too bad, the agreement between the six powers and Iran will not serve the goal of preventing nuclear war in the Middle East. It will not bring us any closer to clean the region from WMD. Actually the danger of nuclear war is much higher when one side is armed with all the weapons and there is no deterrence. It is much more dangerous still when the holders of WMD are racist fanatics with contempt to the lives of all other people (and little regard to their own citizens). It is especially dangerous in the hands of proven serial initiators of wars. Just a month ago, when the Israeli press was indulged with memories from the 40 years old “Yom Kippur” (1973) war, they openly discussed the proposal by some Israeli leaders, notably General Dayan, to deploy nuclear weapons. Calling off the war on Iran was a good idea. Putting an end to the system of military aggression ethnic cleansing and racist apartheid that intoxicates the Middle East will be a much bigger step for real peace. By this time you, my dear Free Haifa readers, are probably angry and despaired of me. What is the justification to maintain your blogger for such a long time on the sunny Haifa beach if when there are real important things happening on the ground you hear nothing of him? Yes, if you rely only on Free Haifa for your news, you might have missed the general strike that was declared for 15/7 by the leadership of the ’48 Palestinians in solidarity with the Naqab (Negev) Arab population, against the new Israeli “Prawer Plan” for comprehensive ethnic cleansing of the area. It was a memorable day, a new step in the evolving historic struggle, as I will explain in the rest of this post. But first let me lay down my excuses for not writing on time. What went wrong with me? Who said that blogging is easy or safe? On Monday 15/7, as part of the declared strike and “day of rage”, I was embedded at your service with some 500 demonstrators, mostly young, on the main junction just before Sakhneen, in the center of the Galilee. To show their depth of solidarity and determination to resist the government crimes, the demonstrators swamped the junction and stopped traffic for over an hour. I was holding a Palestinian flag, which is a good way to show your solidarity and also saves the need to take active part in the quarrel or throw stones when push comes to shoves. It all went very well until the police gathered an impressive force around us, including some Border Guard bullies, “Yasam” gangster-cops and some cops mounted on heavy horses. Having done all this effort in our honor they wouldn’t just let us run away under regular attack. They sent one unit to cut us from the back blocking our retreat path to Sakhneen and attacked at full force, all at once, with horses galloping at the crowd, a barrage of stun grenades with some gas grenades following, and plain clothed detectives catching individual demonstrators, felling them to the ground and beating them. Being slow to retreat and carrying the flag up in the middle of the mess, I became an easy and obvious target to the stun grenades, pretty heavy metal devices that tend to explode, which some cops threw directly at us from short distance. I received 3 direct hits, in both legs and one in my waist. After some time, when things calmed and I could distance myself from the area of confrontation, I was carried by some youth to receive emergency treatment in Sakhneen. Sitting with friends later I heard that some other flag carriers were hit the same way, one child suffered a direct hit in his head which caused a bleeding injury. You blogger went for you also to the Haifa demo on the eve of the general strike. It was a surprise party. For some time activists in Haifa seemed out of focus. The parties stopped working together, somewhat because of bad feelings stemming from sharp disagreements about the Syrian revolution and somewhat because they are busy and divided about the coming municipal elections which are due on October. The youth activists were almost unseen lately after a year of intensive and exhausting support for the prisoners’ strikes. It was at the last minutes that central activists from the Haifa Arab parties created an event on Facebook, calling for a demonstration on Sunday night in Wadi Nisnas. Everybody followed the lead and some 200 people showed up – high attendance by local standards when there is no fresh massacre to draw the people out. After more than half an hour the youth were bored of standing in one place and started a march on Alenby Street, toward the German colony. As the whole development was spontaneous the police didn’t have the force to confront the demonstration and all went well. Reaching Carmel Avenue, the main street of the turistic area, the demonstrators stopped at the middle of the junction and halted the traffic for some time. Later the continued marching down Carmel Avenue between the posh coffee shops until “The Prisoners Square”. The dynamics of the Haifa demo gave the tune to what happened the next day. The reluctance of the parties and the traditional leadership that felt obliged to do something to stop the mass expulsion of the Naqab Arabs – but are not in a position to lead the masses to struggle. The growing number of youth activists that follow the example of the Arab Spring, learn new methods of struggle and use social media to organize. The same pattern spread over the country on July 15. The general strike was declared some time ago by the leadership of the Arab Palestinians in the 78% of Palestine that is occupied since 1948. This leadership is organized under the umbrella of “The High Follow Up Committee” (Lijnat Al-Mutaba’a Al-‘Uliya), which is led by the Arab (and common Arab-Jewish) parties and includes in some ways representatives of the civil society. The angry young activists would say that “Al-Mutaba’a” don’t want to lead a real struggle. In my view it is more unable than unwilling. In this specific case, by declaring a general strike, it clearly aimed for a level of struggle that the masses couldn’t follow. Schools are on vacation and Arab Workers are un-organized, marginalized in the economy and in many cases are afraid to loose their job. In the end the strike was mostly limited to the Arab local councils. As I heard, Arab merchants in the old city of Akka (Acre) proved that the patriotic fever that has recently caught the city’s youth didn’t skip them and the market was mostly closed. What made this day a success was the initiative of the youth activists that announced on the internet that this day will be a “day of rage” and streets will be closed. In fact the term “Day of Rage” already appeared in the official call for strike by the “Mutaba’a” – but it the youth activists everywhere that filled this declaration with real content. On Monday morning there was a marching demonstration in Bir As-Sabe’e (Be’er Sheva) – the main city of the Naqab. The police claimed that the demonstrators didn’t obey their instructions and caused more disruption to the traffic that they were allowed to. After some time the police attacked the demonstrators and there was a confrontation. Some 14 demonstrators were arrested. The other 2 main demonstrations were called on the entrance of Um Al-Fahm – the main city of the Arab “Triangle”, and on the entrance of Sakhneen, to 17:00 of the same day. In Um Al-Fahm, the “Wadi ‘Ara” highway was closed for more than an hour, but the police preferred to stand by and avoid violence. They had previous experience what happens when a demonstration becomes an open confrontation between violent police and stone throwing youth. A prolonged confrontation can keep the main route closed for many hours. There were also several other local demonstrations, of which I heard of Majd Al-Kurum, Al-Makr, Akka and Yaffa. Most of them were well attended and exceeded the regular parameters… and in most of them the police chose not to intervene. In occupied Al-Quds (Jerusalem) the police attacked a demonstration, wounded and arrested many of the participants. In Ramallah and Gaza, the different local Palestinian authorities intervened to prevent or limit local youth that tried to organized parallel protest against Israeli Ethnic Cleansing. In Sakhneen there were some 15 people arrested, including 3 women. On Tuesday some 150 people waited the whole day in the Akka court to try to see the detainees. We heard horror stories about the behavior of the police during and after the arrests. One young demonstrator was thrown on the ground and beaten, probably he lost his consciousness. A policeman was sitting on him, beating him and shouting: “Die, Die Now!” Others were beaten in the police station. At the end of the day some of the people that attended the court hearings organized another demonstration in Akka. Over the week there were more demonstrations, notable several demonstrations in The Clock Square in Yaffa and another biggish demonstration on Thursday in Haifa. Where does the Naqab Day stand in historic perspective in the struggle of the ’48 occupied Palestinians? The first general strike in the ’48 territories after the 1948 Nakba was in “Land Day” on March 30, 1976. It was a direct response to mass land confiscation in the Galilee. At the night before the day of the strike Israeli Army invaded Sakhneen, Arabeh and Dir Hana, initiating confrontation with the local population in which 4 of the locals were shot dead. The result was that the strike became a day of mass confrontation with the police all over the country, in which two more demonstrators were killed. Most other general strikes came as a response to Israel’s massacres against the Palestinian people: The Sabra and Shatila massacre in 1982, the mass killing of Palestinian demonstrators in the beginning of the first Intifada in December 1987, the massacre in Al-Khalil in 1994 and so on. In the beginning of the second Intifada, in September 2000, the massacre begun in the West Bank and Gaza, but the Israeli police (under the ‘left’ Labor) prepared snipers to shoot and kill demonstrators on this side of the green line also. The killing of 13 demonstrators in the Triangle and the Galilee enhanced the sense of unity with the Intifada and caused a 10 day’s general strike and mass confrontations with the police. The current strike and demonstrations were not a hot response to sight of blood and burned bodies. It was a calculated political move to press the Israeli government to stop evacuation and house demolition against the Naqab Arab. Most of the activity, from Yaffa through the Triangle to Haifa and the Galilee was not by the immediate victims. The demonstrators, in most cases, applied the tactics of civil disobedience rather that all-out confrontation. It is the new “silmiya” (peaceful) of the Arab Spring – a studied way to press your point and try to save some force for a prolonged struggle. The police also, at least in some places, learned something from experience, and avoided confrontations that would highlight the effect of the protest. The police brutality in Sakhneen proved that it is only a thin mask of civility – behind it there is still the same brutality and racial hatred. Writing all this about the struggle – there is not much place left for the most important thing – the fate of the Naqab Arab population. The conditions of the Naqab Beduin are the most shameful expression of Israeli Apartheid. Tens of thousands of people leave there in unrecognized villages, deprived of the most basic services like electricity, water, sewage, roads, schools and clinics. In some places you may see the Israeli “Socialist” Kibutz utopia at the top of the hill, with all the comforts of modern lives from Air Conditioning to swimming pools, and the sprinklers spray water on the green lawns, while on the other side of the fence the Beduin have no drinking water – the only water that you see there is the sewage of the Kibutz that runs down the hill. The whole idea of Zionism is to drive Palestinians out of their land, and now in the Naqab one of the biggest chapters of Zionist Ethnic Cleansing is folding before our eyes. The main goal of the day of rage on July 15 was to be a wake up call – for ourselves and for the world. We have a serious and urgent struggle to wage. Ethnic cleansing must be stopped now. The Israeli racist Apartheid regime must be dismantled. I have a neighbor. He is a quiet man, working hard in construction and after work he would stay with his family. You rarely even see him in the neighborhood. One morning I saw him sitting in the street – he had a story to tell. He is from Jenin. He married in Hallisa (our Haifa neighborhood) and came to live with his wife here. They are already married for some twenty years but he couldn’t get his papers right. As the occupation gets old, so do many of its victims. So, that night, my neighbor felt his heart was betraying him and hurried to the hospital. Apparently it was not that bad. After checking him and verifying that he was no dying, the doctors in the hospital called in the police, which, at 3:00 am, drove him to Jenin (some 45 km south east of Haifa) and threw him on the other side of the army block. In the morning he was already back in Hallisa, but didn’t go to work, so I had the chance to hear the story. I wondered about the doctors. How the hell would they call the police to take the man in the middle of the night? Many healthy people would have a heart attack just to see the police at such an hour, to say nothing about being thrown away beyond the army lines in the middle of the night. My neighbor survived this experience – but probably the next time that he will feel his heart stuttering he will think twice before going to the hospital – so he actually may die from this harsh experience. Today (6/6/2013) – as Adalah was opening a photo exhibition about the lives of victims of Israeli racist citizenship law – I learned that the doctors that called the police to take my neighbor were not alone. Apparently they were “just following orders” – or working according to the standard procedure in Israeli hospitals. Fatma, the women that agreed to tell the attending public about her plight, was not expelled like my neighbor. She is a special case – she has a court order preventing her deportation. (Probably this is why she agreed to talk while most other victims prefer to stay anonymous). But she told how, just two hours after she was operated on in an Israeli hospital, police was coming to arrest her and throw her in the Palestinian Bantustan. She needed the fast intervention of her lawyer to be released. The fact that Adalah, The Legal Center for Arab Minority Rights in Israel, moved from the legal struggle against the law in Israel’s Supreme Court to sponsoring a photo exhibition is a vivid illustration of the failure to defend the most basic Human Rights within the legal framework of Apartheid Israel. The law passed initially in 2003, banning family unification of Israeli citizens with residents of the 1967 occupied territories. It was justified as a temporary “security” measure at the height of the second Intifada. The courts, at the first hearing, had hard time justifying the allowance of such temporary measure of “collective punishment” and wholesale denial of rights to take place. Since then the law was extended for already ten years and expanded to prevent family unification with citizens of some other Arab countries (and Iran). The security pretext gave way to the openly racist “demographic” motivation. Most Israeli legislators got used to enjoy the political benefit of being openly racist and the courts were packed with more right wingers and settlers and stopped blushing while giving its stamp of approval to openly racist laws. The Citizenship Law stands out as a symbol of inhuman cruelty – even among Israel’s long array of racist laws – despite the tough competition. Maybe because the right to family life is such a basic thing that we are all used to take for granted. Forcefully state intervention to separate husband and wife, preventing them from living together with their children – well, any of you can imaging how much it undermines the very basics of human lives. Another daunting aspect of the law, which was described in detail in the exhibition photos as well as in the stories that we heard at the opening, was the way that the devil of racism settles as a permanent influence in the middle of each home of the “interrupted families” – and there are about 15,000 – 20,000 families directly involved. And the devil is also in the details: Children that can’t visit their grandparents that live a few kilometers away; being forbidden from driving a car; being denied medical treatment. Sometimes the devil of racism enters the victims themselves – we were told of women that suffer from a violent husband but don’t dare to complain – or to run away – as they might be expelled and not allowed to see their children again. There was some good news also: As of 2013, even as ethnic cleansing is still the main Israeli goal, it should be easier for people with only temporary entry permit to find a legal job. So medical treatment is still a taboo – it is a clear offence against Israel’s Jewish identity and danger to its Democratic Jewish character – but oiling the wheels of Israeli capitalism is another thing. All the speakers in the ceremonial opening failed to give even a glimmer of hope. They tried everything over the last ten years and there is no way to change the law. There is no way that the Jewish state will be democratic (or just human) for other people also.